Pasta is something my hubby and youngest son could eat every other day. I on the other hand eat pasta less frequently. But, on the occasions that I really have a taste for pasta I prefer to keep it light if possible. The other day I thought about finally writing up the recipe to my delicious pasta salad (according to some friends) but switched gears when I was looking through the frig and saw a beautiful bag of arugula. 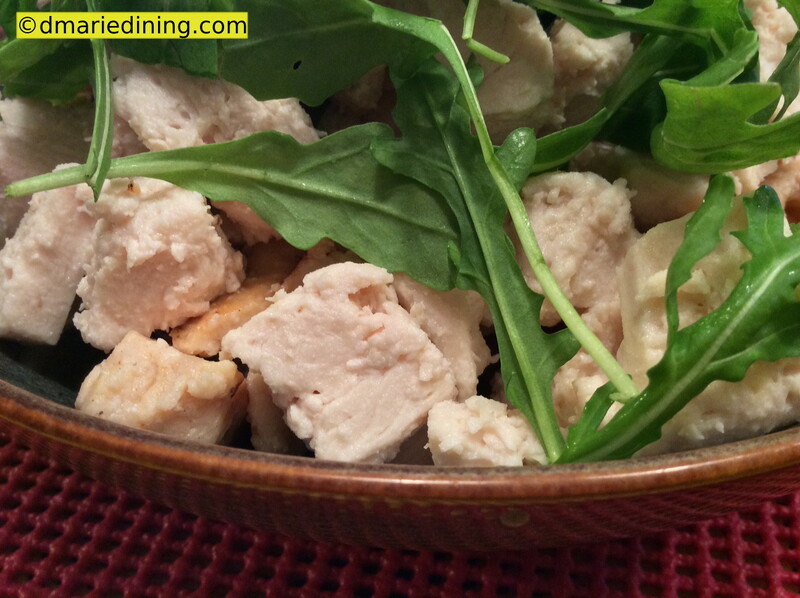 Arugula has a unique nutty taste and I like using it in various salads and in my Chicken and Pasta with Lemon Cream Sauce recipe. Since making a light pasta dish was my goal I thought tortellini would be a good choice to go with the arugula. Tortellini is small but can be quite filling. 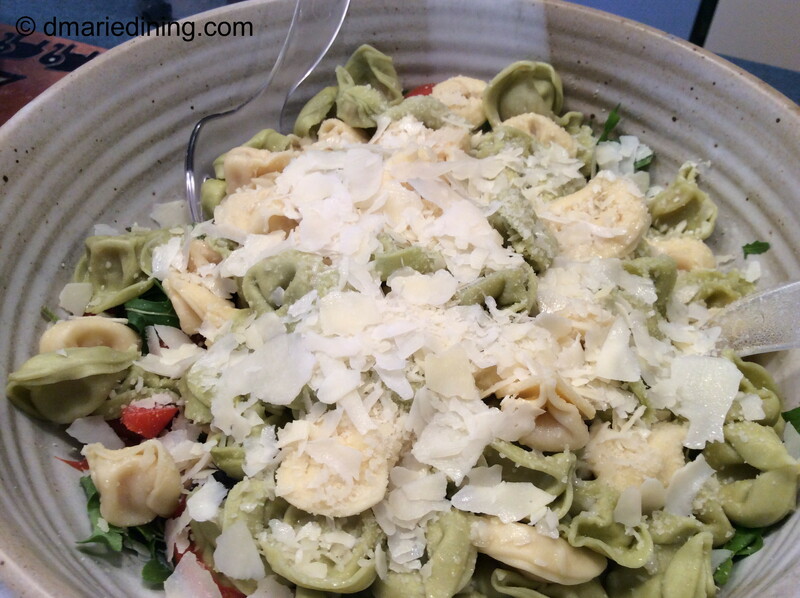 Plus, tortellini is fille with wonderful things like cheese, spinach and sun dried tomatoes. I usually buy mixed tortellini just so I can have an abundance of flavors playing with my taste buds. My son is not much of a salad person so I was not sure if he would even try the tortellini salad. I had two things going for me though. One… he loves any kind of pasta and two…. 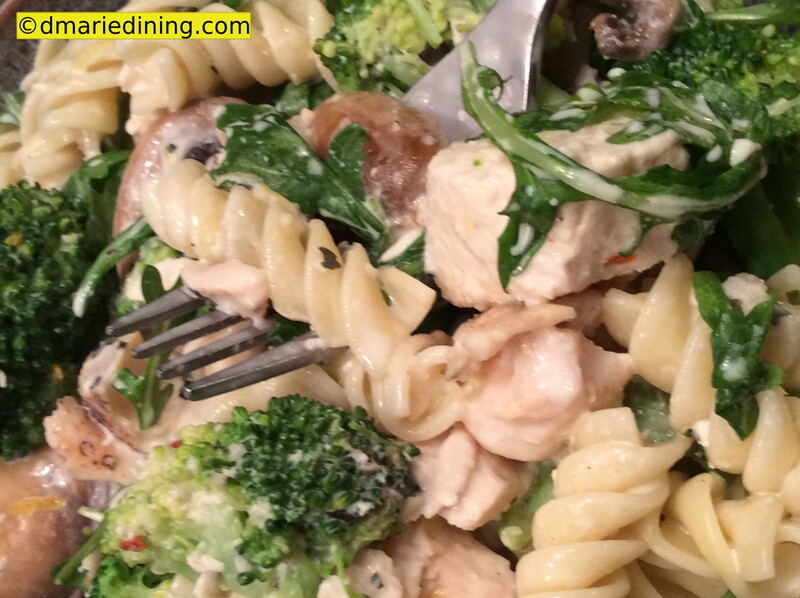 he loved the Chicken and Pasta with Lemon Cream Sauce recipe which had arugula in it. True to form, he gave me a thumbs up because of the pasta. Now I know for sure no matter what recipe I make my son will eat it as long as it has pasta. 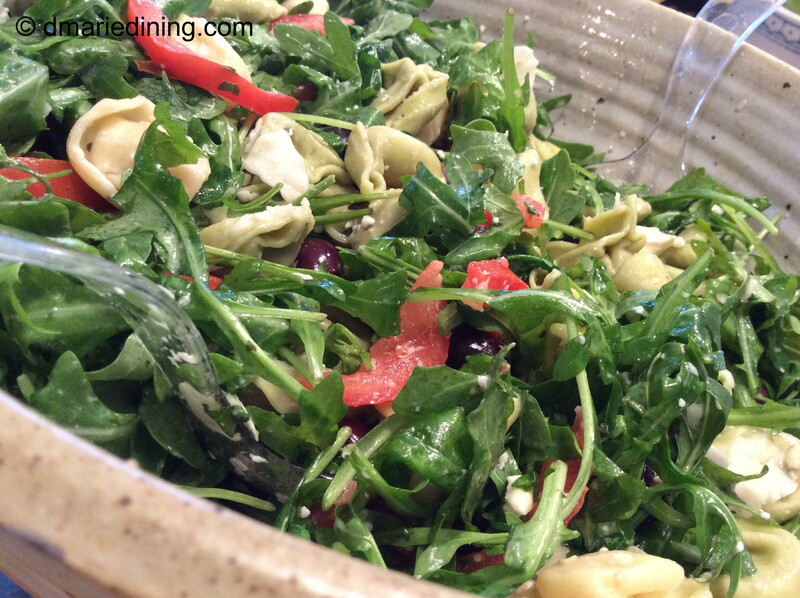 I also know tortellini and arugula make a pretty good salad. Place arugula in a large bowl. Add olives, feta cheese and tomatoes. Top with shaved parmesan cheese and sprinkle with cracked black pepper. Prepare tortellini according to package and drain. 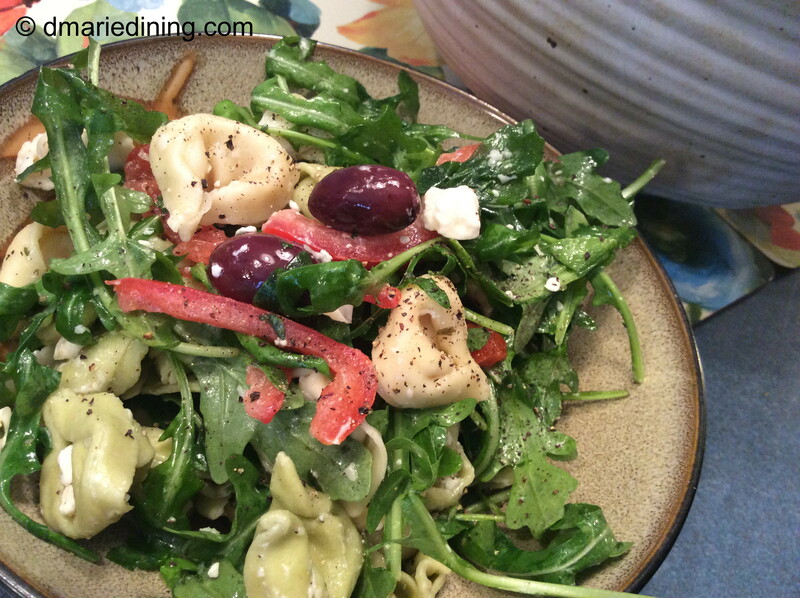 Add hot tortellini to the bowl then pour salad dressing over pasta. Gently toss pasta and arugula together until well mixed. Enjoy as a warm salad or chilled slightly. 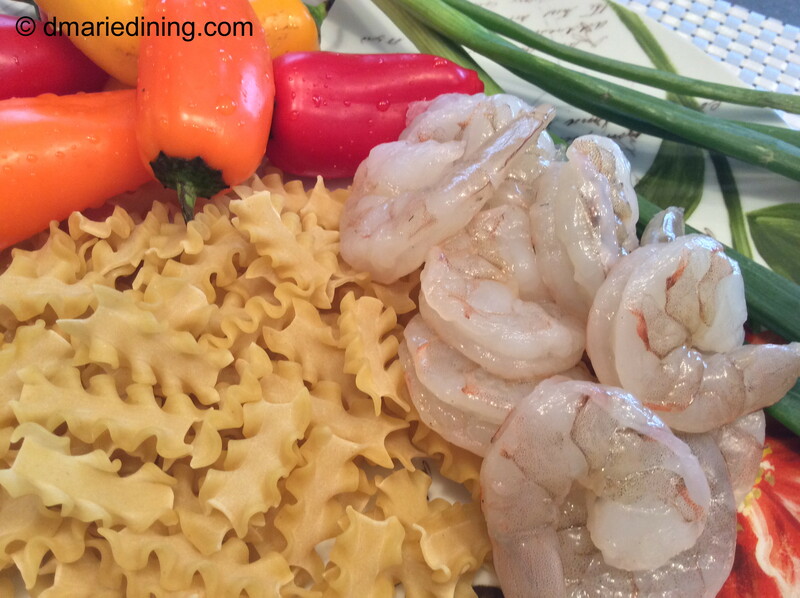 Creamy shrimp and pasta has become a party favorite when we host big celebrations or a small get together. 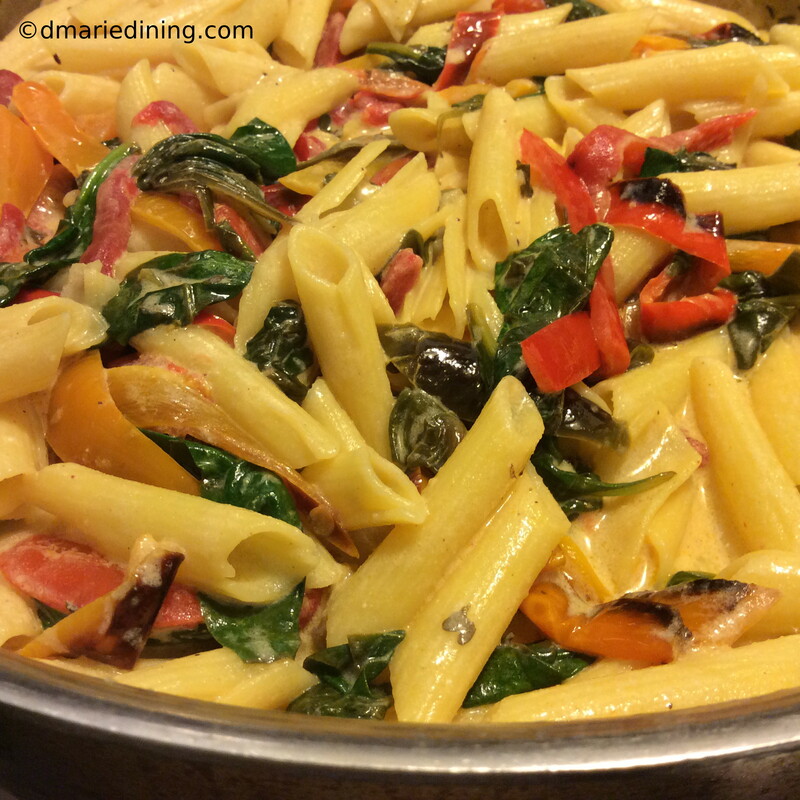 Typically, I use penne pasta when I make pasta for a party lately I have been trying different types of pasta with this dish. 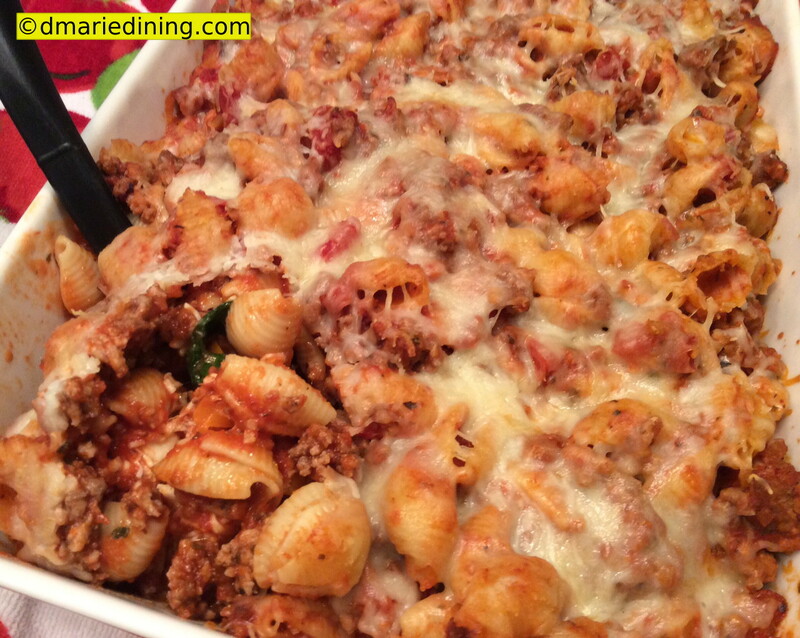 The last time I made this for my family I used mafalda pasta which looks like little lasagna pasta ribbons. 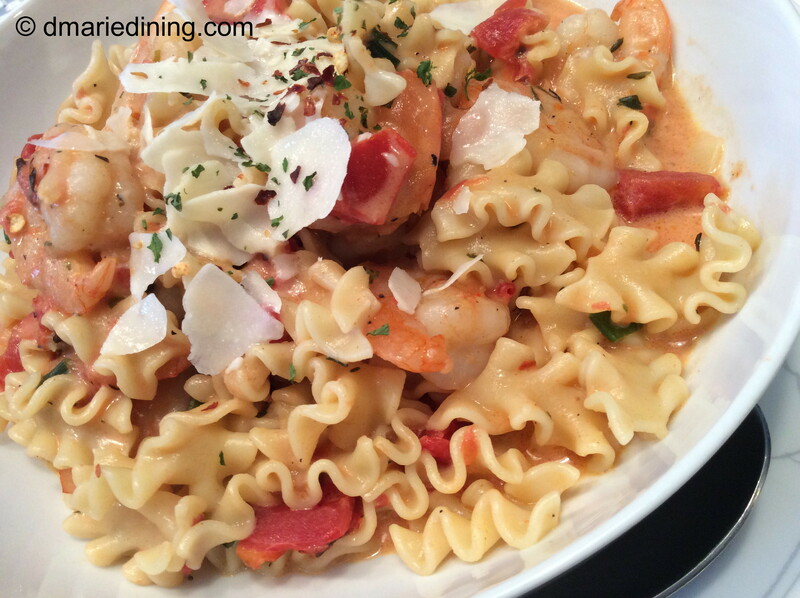 I fell in love with this pasta and so did the hungry folks that gobbled it up. My son’s best friend (who I consider my third son) recently spent the weekend with us so the two of them could hang out. 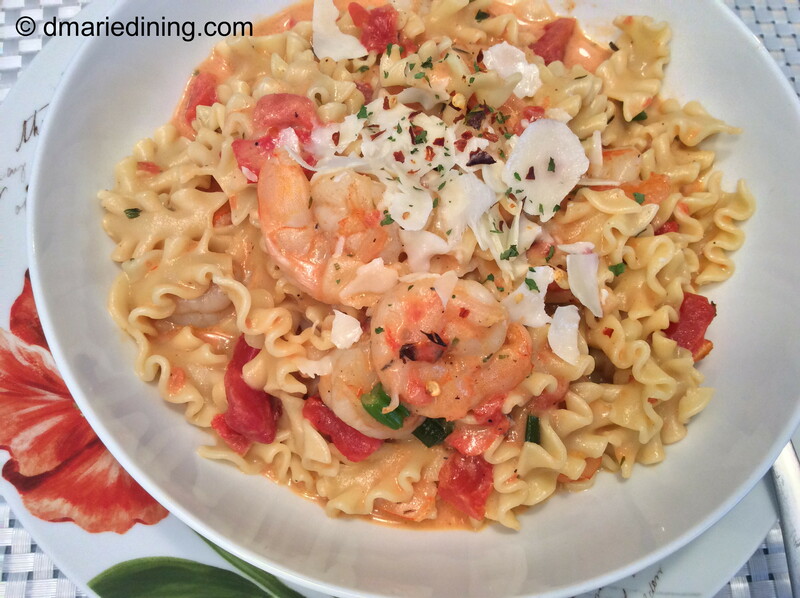 I had decided to include my creamy shrimp and pasta recipe on dmariedining.com so I needed to prepare the dish so I could take some photos. I thought the guys could have a little for lunch and then I could have leftovers for later. I quickly found out that “leftovers” is not in a teenager’s vocabulary. Fortunately, I had put aside of bowl of the pasta for my hubby before the boys jumped on the pot. I on the other hand only had one forkful! My youngest son surprised my when he said Mom I know I eat a lot but K cleaned out the pot. I asked them if all of the pasta was gone and K said with a big grin on his face “Sorry, I just love pasta!”. I am happy anytime my family enjoys the meals I make so I couldn’t be upset. Plus, by the sound of their forks scraping the bottom of the bowls I knew they liked it. What more can you ask for when feeding a hungry crew? Prepare pasta according to package. Saute shrimp in olive oil over medium high heat in a large frying pan. Season with salt, pepper and garlic. Cook until shrimp is pink. 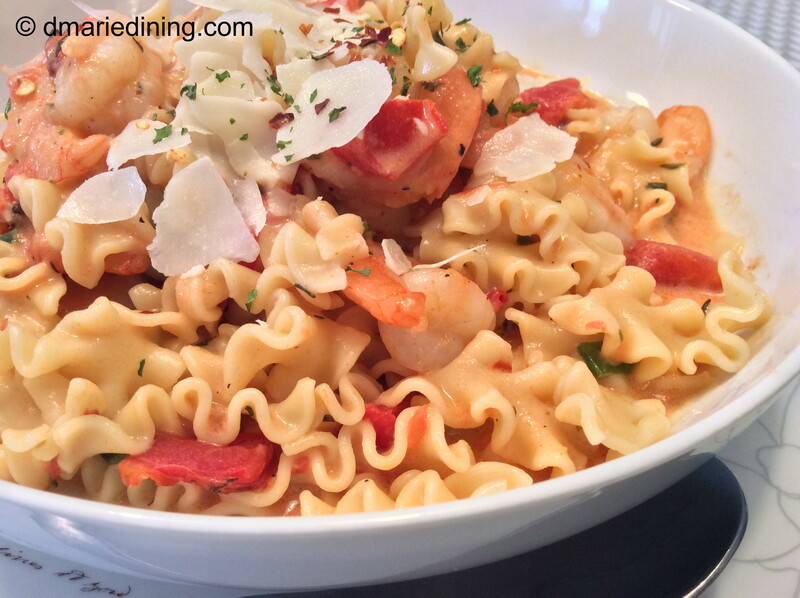 Remove shrimp from the pan and add tomatoes, scallions, parsley, red pepper flakes and wine. Cook for 1 minute then stir in cream. Bring to a boil. Reduce heat to medium low and simmer for 10 minutes until sauce thickens. Add cheese, basil, pasta and shrimp. Toss until well mixed. Inspiration for new recipes come from many different resources. Sometimes it comes from walking through the grocery store and seeing items in a fellow shopper’s cart. Sometimes it comes from a cooking show or a sudden desire for a certain type of food. 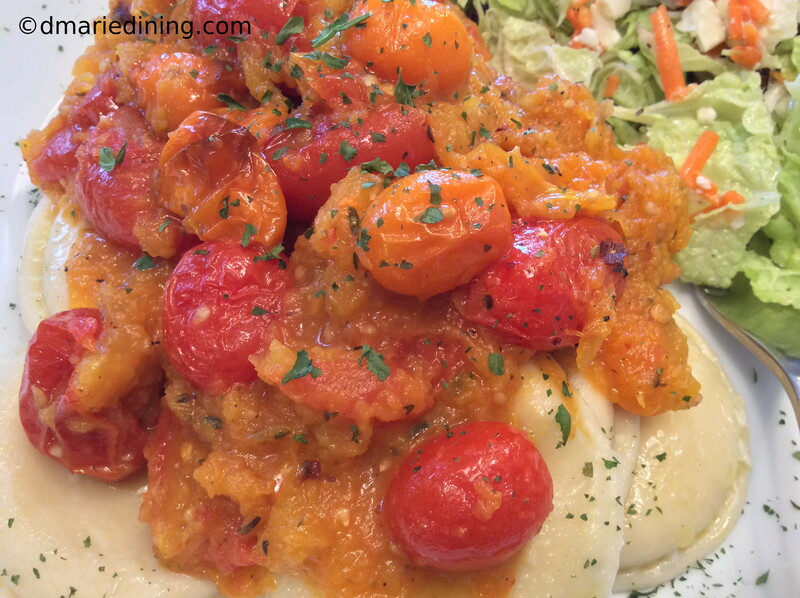 I was inspired to create a ravioli dish with a butternut squash and roasted tomato sauce after speaking with a co-worker. It seems I interrupted his lunch one day so I asked him what he was eating. He told me it was ravioli with butternut squash which sounded good to me. I didn’t have any idea of how the squash was incorporated into the ravioli but it gave me an idea. I envisioned beautifully roasted tomatoes blended with soft butternut squash topped with shaved parmesan cheese smothering the ravioli. I turned that vision into a recipe I think folks will enjoy. Cheese ravioli and spinach ravioli were two winners in my household. However, I am sure this recipe will work with whatever is your favorite ravioli. Prepare ravioli according to package. Drain and drizzle a little olive oil over the ravioli. Set aside. Reserve 2 tbsp of pasta starch to add to butternut squash. 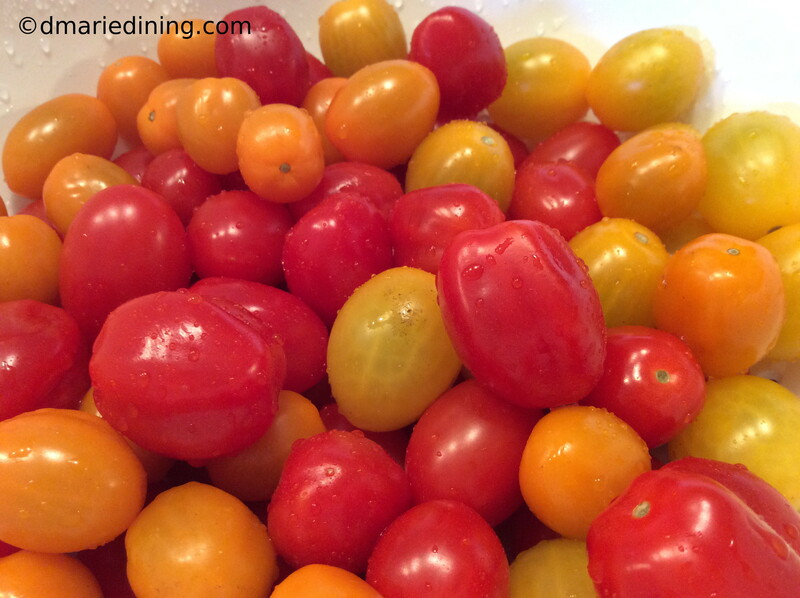 Place tomatoes on a rimmed baking sheet and drizzle with 3 tbsp of olive oil. Sprinkle with sea salt and black pepper. Roast for 35 to 40 minutes. Melt butter along with 1tbsp of olive oil in a large frying pan. Add butternut squash, water and pasta water. Sprinkle with remaining seasonings including a little salt and black pepper. 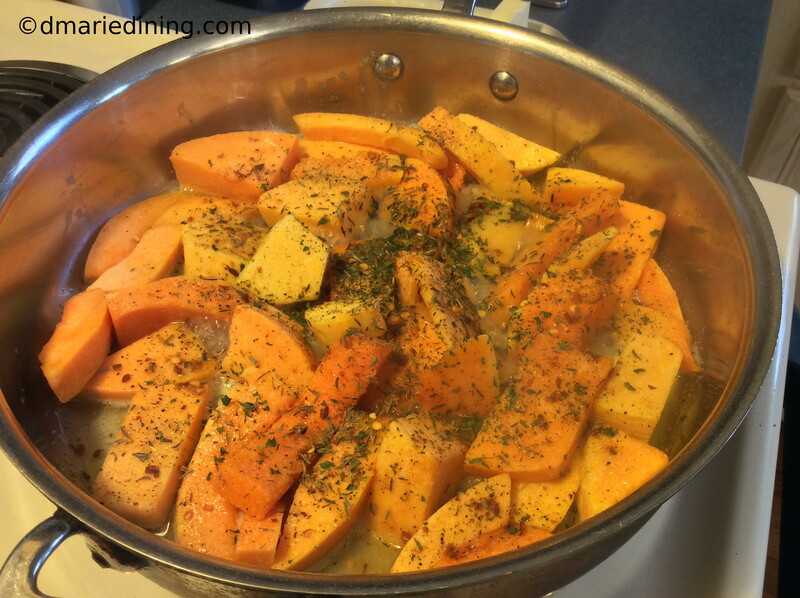 Cook over medium heat until squash is soft and tender. 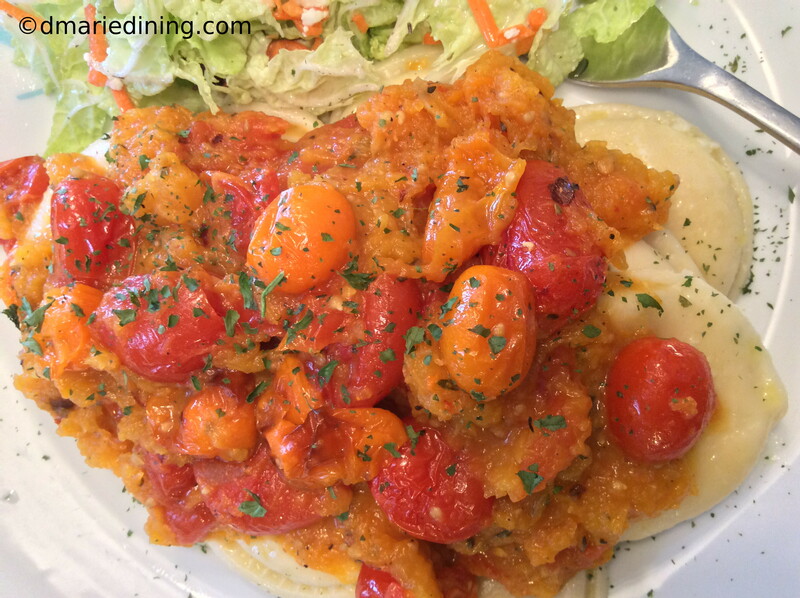 Add roasted tomatoes to butternut squash and gently mash both with a fork leaving some small chunks of butternut squash whole tomatoes. Spoon over ravioli and top with shaved parmesan and parsley. On days I want to be really healthy and stay away from red meat or pork “the other white meat”, I turn to my one true favorite – salmon. 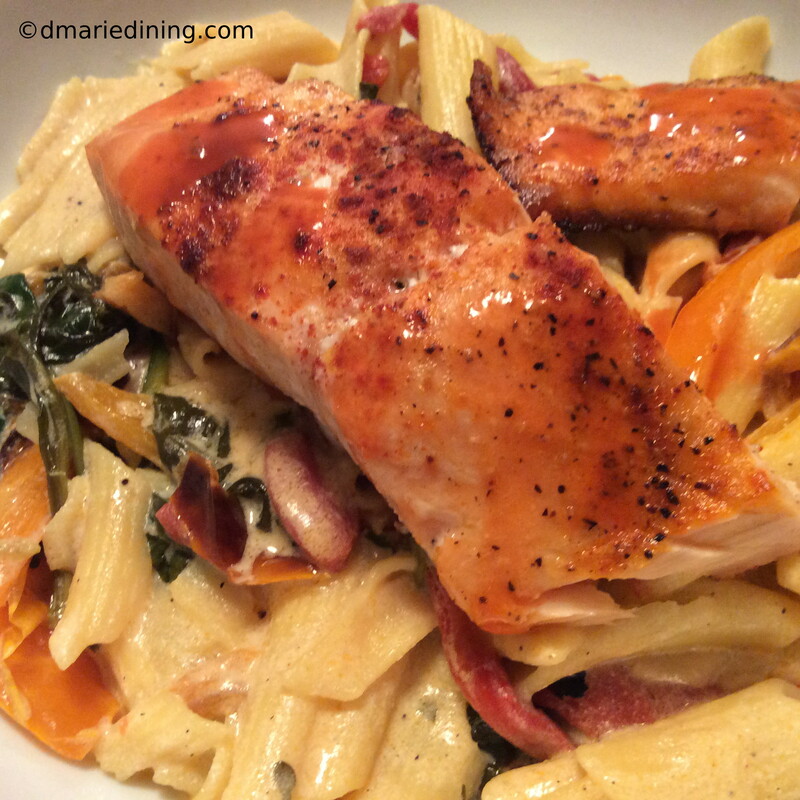 Since my hubby and son love pasta so much I knew if I added salmon to a pasta dish they would love it. Preparing pasta is simple and so is fixing salmon. 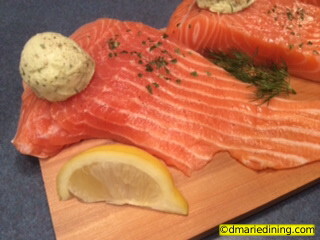 As long as you pick out a nice salmon fillet and have the right seasonings you will be golden. The right seasonings means you need to pull together a combination of spices that will make the dish pop and your taste buds do a little dance in your mouth. A little heat from red pepper flakes or cayenne will usually wake up the taste buds but to make them dance you need more. Garlic, capers, mixed peppers and lemon juice. Bitter, salty, sweet and sour. Something to tickle each taste bud and brighten up the dish. Splash a little cream into the mix and you will not be sorry you decided to make something healthy. Prepare pasta al dente as directed on box. Set aside. Reserve 2 tbsp of starchy water from pasta. Season salmon with salt, black pepper, garlic powder and smoked paprika. Place 1 tbsp butter on each salmon fillet. Bake for 15 to 20 minutes until cooked through but still moist. Set aside to rest. Heat 1 tbsp olive oil to a small frying pan. Add fresh peppers and saute until slightly browned. Melt 1 tbsp butter in a large frying pan along with olive oil over medium high heat. Add garlic and saute for 1 minute stirring constantly. Reduce heat to medium then pour in heavy cream along with half and half and starchy water. Simmer for 2 minutes then add sauteed peppers, capers, parsley, lemon juice, lemon zest and remaining seasonings. Stir to blend. Add spinach and let it wilt. Once spinach wilts stir in pasta to coat with sauce. Place pasta in a bowl and top with salmon. Pour a little sauce over the salmon then enjoy. 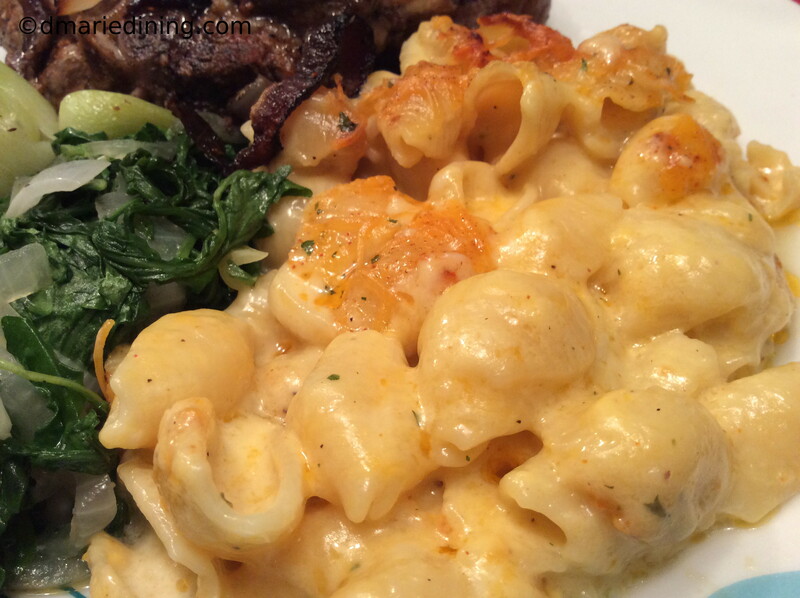 Macaroni and cheese is one of the best comfort foods ever made. Recipes for mac and cheese have been passed down from generation to generation. My family is no different. My mom passed on her mac and cheese recipe to me when I started learning how to cook. I am sure it is the same recipe my grandmother passed on to my mom and her sisters. Tradition is important when it comes to family and cultures. Without traditions our histories would not be as rich and wonderful. We would not know or understand the meaning of true love, sacrifice and success. Yes, traditions are important and each family has at least one tradition that is passed on and on. However, as new families are created so are new traditions. Although I have made my mom and grandmother’s mac and cheese for years, I recently decided to try a new recipe. 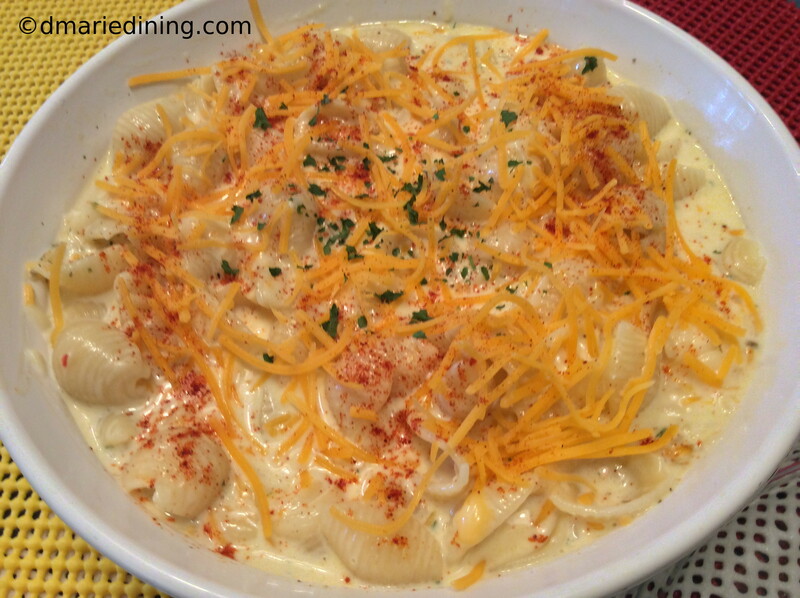 I was inspired by a show on Food Network where Giada featured a macaroni and cheese dish she loves. 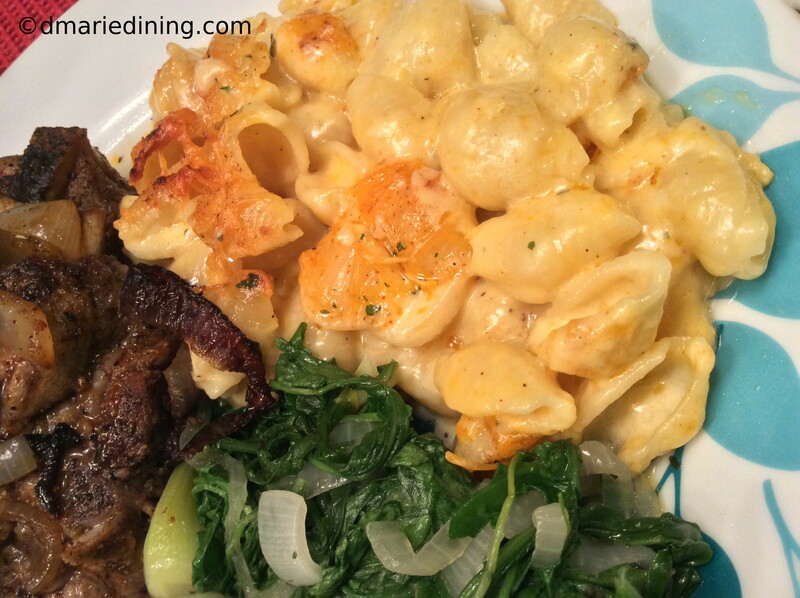 Giada’s macaroni and cheese included fontina cheese among other cheeses. I had never considered using fontina cheese in my mac and cheese. Fontina cheese is a semi-soft Italian cheese that has a rich and creamy texture with a slightly nutty flavor. My traditional mac and cheese called for extra sharp and sharp cheddar cheese period. New traditions call for new ingredients. My new mac and cheese includes five different cheeses. After all, the main attraction in macaroni and cheese is the cheese. Bringing together several different cheeses raised the flavors to a new level of goodness. Also the various textures of cheese which were hard, soft and semi-soft made the dish extra creamy. I will always love my mom’s mac and cheese but with my family I am creating new traditions to pass on to my children and grandchildren. Prepare pasta according to package adding 1 tsp of salt to the water. Drain and reserve ½ cup of pasta water. 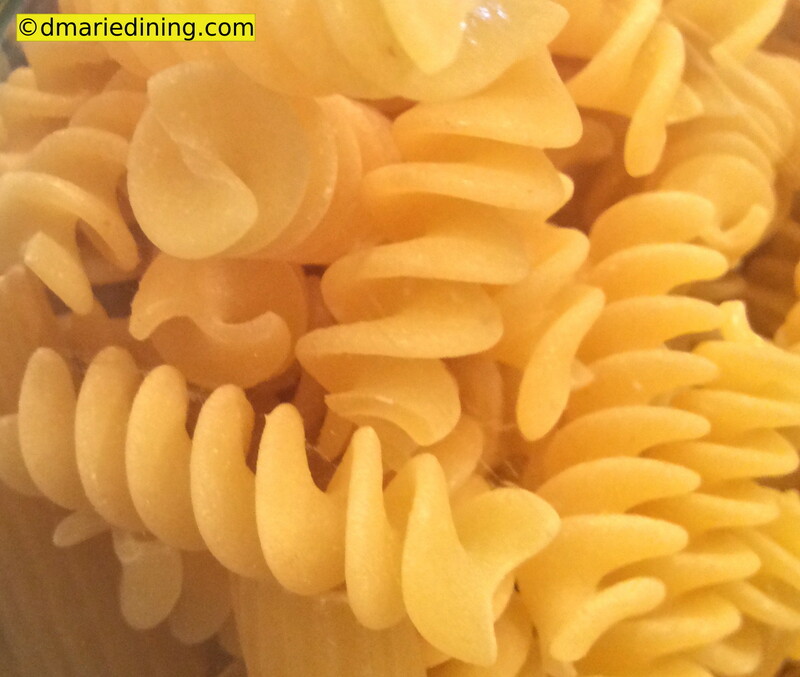 Stir 1 tablespoon of butter into the pasta to coat. Season with black pepper. Spray a medium casserole dish with cooking spray. 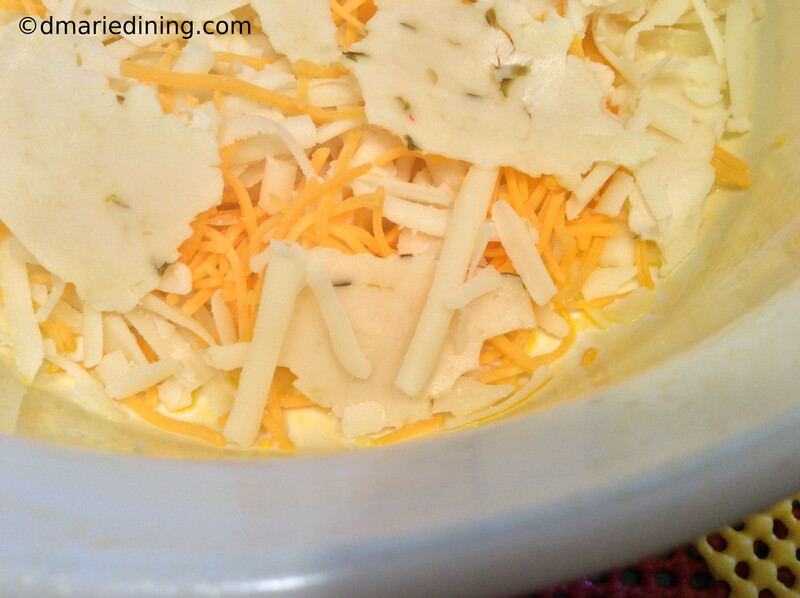 Sprinkle a tablespoon of each cheese in the bottom of the casserole dish. Add half of the pasta and half of the cheese. Add remaining pasta and cheese. Pour half and half along with 2 tablespoons of pasta water over cheese and stir to mix cheese into pasta. Make sure cheese is well blended into the dish. Sprinkle a little cheddar cheese and paprika on the top of the dish. Bake for approximately 40 to 45 minutes until golden brown and bubbly. I am not a huge pasta fan like my family but I am slowly coming around to putting it close to the top of my list. Especially after I came up with a chicken and pasta dish that is slightly creamy with a hint of lemon. Usually when I make pasta it is as a side dish unless we are having spaghetti. 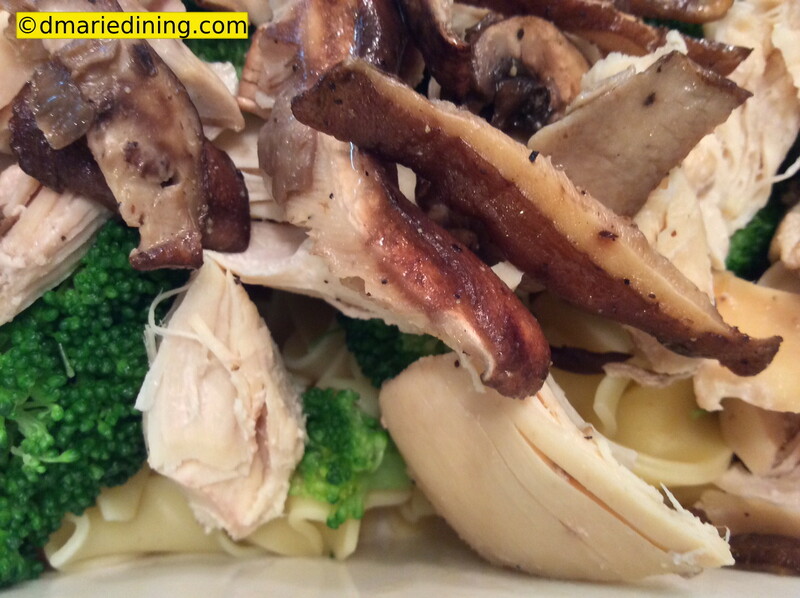 When I pulled together the chicken and pasta with lemon cream sauce I wanted to create a meal rather than a side dish. I love making one pot meals whenever I can. This one only takes a couple of pots so … that is close enough. As my culinary skills continue to grow I have discovered that things I thought were difficult to prepare are relatively easy. The idea of making cream sauce was somewhat intimidating to me until I figured out the sauce really makes itself. With the right seasonings and a little patience you can create a savory sauce that will elevate your meal. Bring 4 quarts water with a pinch of salt to a boil. Add broccoli to boiling water for 3 to 4 minutes. Remove and place in ice bath to stop the cooking process for 5 minutes then drain. Bring water back to a boil and cook pasta according to package. Drain pasta and place in a large bowl. Add broccoli, seasonings and parmesan cheese then set aside. Add olive oil, butter and mushrooms to a sauce pan over medium high heat and saute until lightly browned. Add garlic and be careful not to let garlic burn. Add heavy cream lemon zest and lemon juice. Stir and let cook for 5 minutes. Reduce heat to medium then add chicken and mushrooms. Cook for another 5 minutes until sauce thickens slightly stirring occasionally. Remove from heat and pour over pasta. Toss pasta until coated with sauce. Add arugula and continue tossing. Arugula will wilt slightly from the heat. Sprinkle with a little more parmesan cheese and serve immediately. Many, many years ago when I was still living at home lasagna became my specialty dinner to make for the family. My cousin Shirl taught me how to make an “authentic” Italian sauce. Needless to say it took hours of simmering the sauce and layering seasonings to make the dish taste absolutely wonderful. It also took a while to assemble the lasagna between the pasta, sauce, meat and cheese. Fast forward to today and I can honestly say I do not have the same amount of time to cook as I did many, many years ago. I still love lasagna but now I prefer a lighter version of my old layered lasagna. The new recipe is filling but does not make you feel sleepy or bloated after you eat. 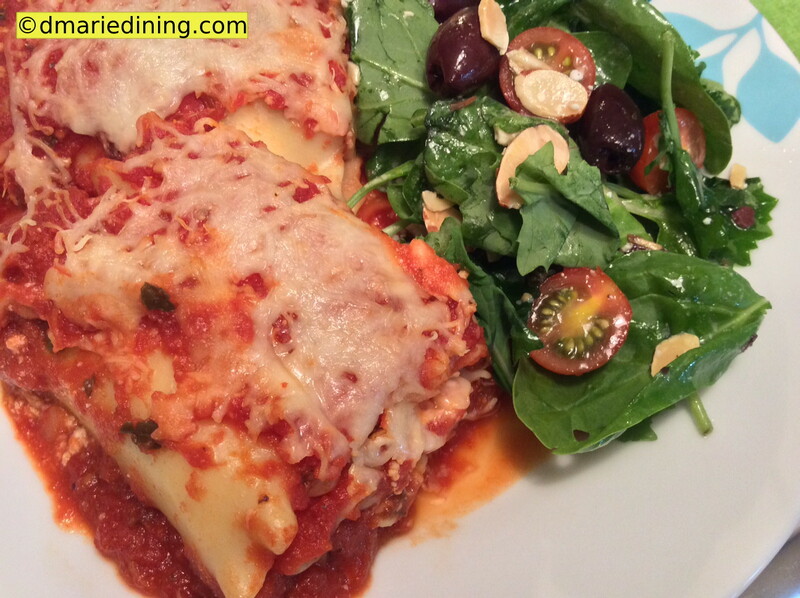 Rolled Lasagna is just a simpler way of layering lasagna without losing all of the wonderful flavors you find in a typical lasagna casserole. 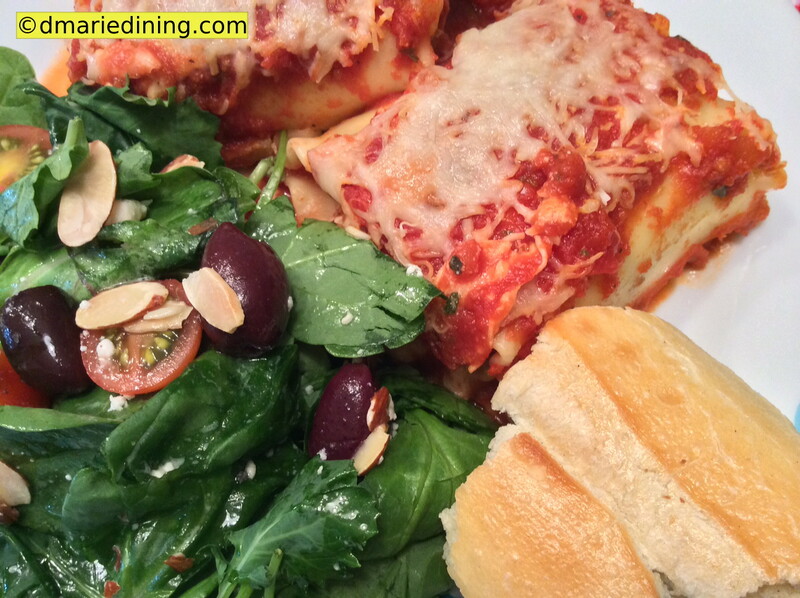 To keep it light, I replaced the ground meat with prosciutto and added spinach which gives the lasagna a nice finish. 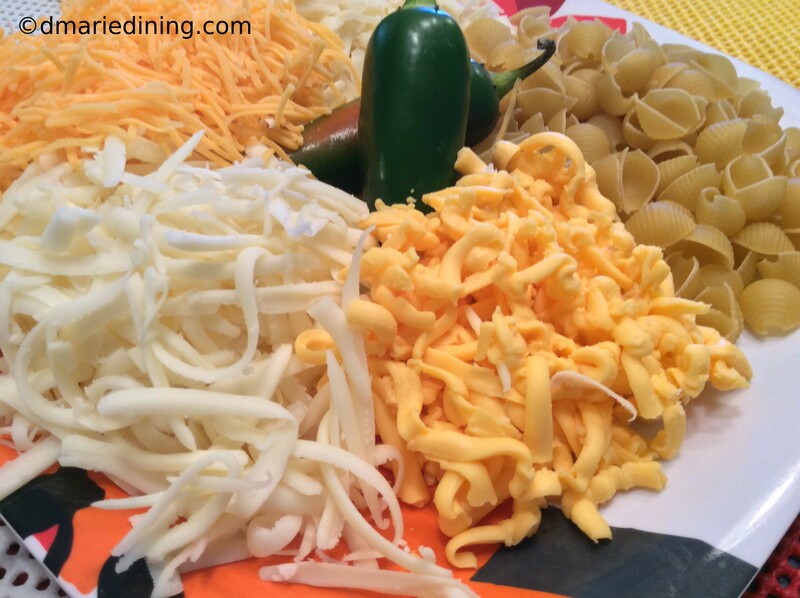 Besides flavor, one of the best things about my Rolled Lasagna recipe is that each lasagna noodle is individually portioned. Getting seconds is easy and so is clean up. 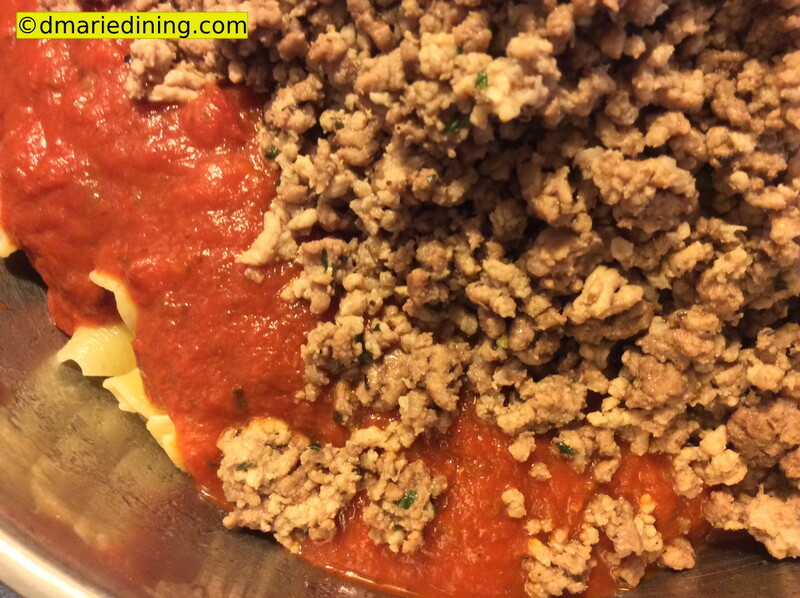 Cook lasagna noodles according to package then lay out flat to cool. Drain spinach and season with salt and pepper. Set aside. In a small bowl mix ricotta cheese, Parmesan cheese, parsley and basil. Take one lasagna noodle a spread the cheese mixture over the noodle. 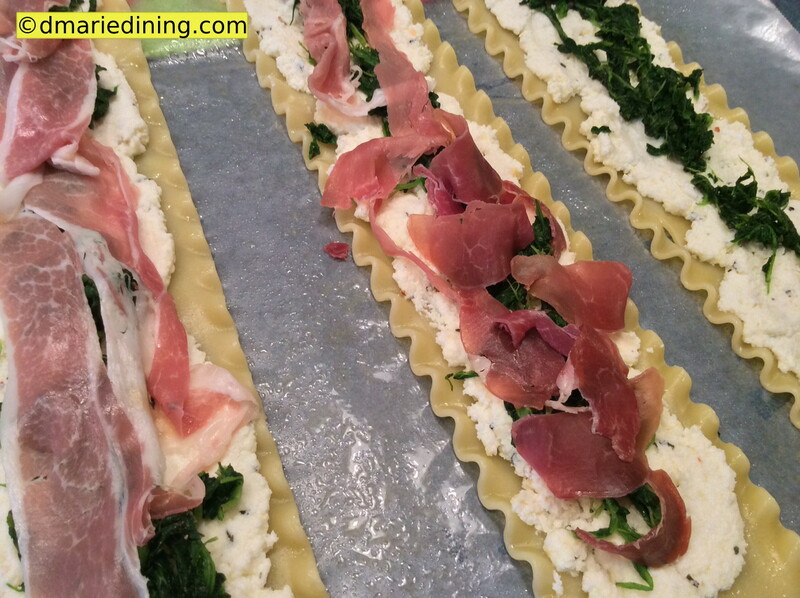 Add two pieces of prosciutto to cover the cheese then add dollops of spinach on top of the prosciutto. Roll up the lasagna noodle from one end to the other. 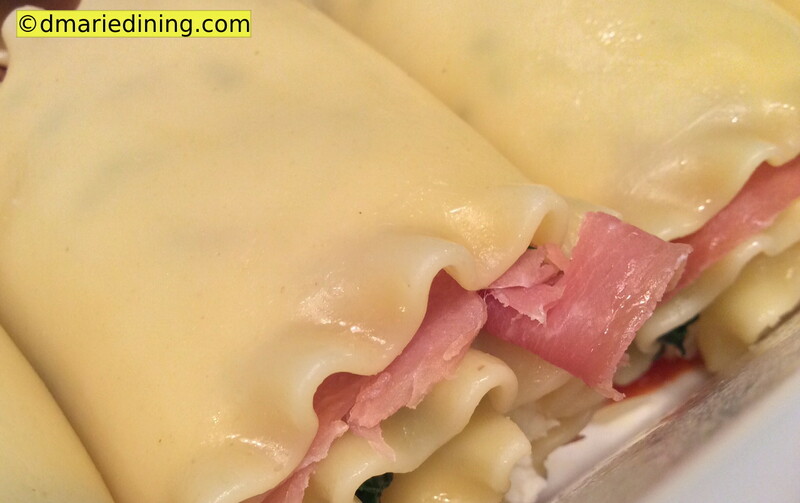 Place the rolled lasagna seam side down in a casserole dish. Repeat rolling with remaining noodles. Pour sauce over lasagna and then cover with mozzarella cheese. Bake for 30 to 40 minutes until cheese is melted and slightly browned. I was watching a cooking show the other day that was dedicated to Mediterranean cooking which my family and I really enjoy. The seasonings used in Mediterranean cooking are a lot different from those used in southern cooking. I always like a challenge whether in cooking or elsewhere so I decided to stretch my imagination and learn how to fix a simple Mediterranean dish. 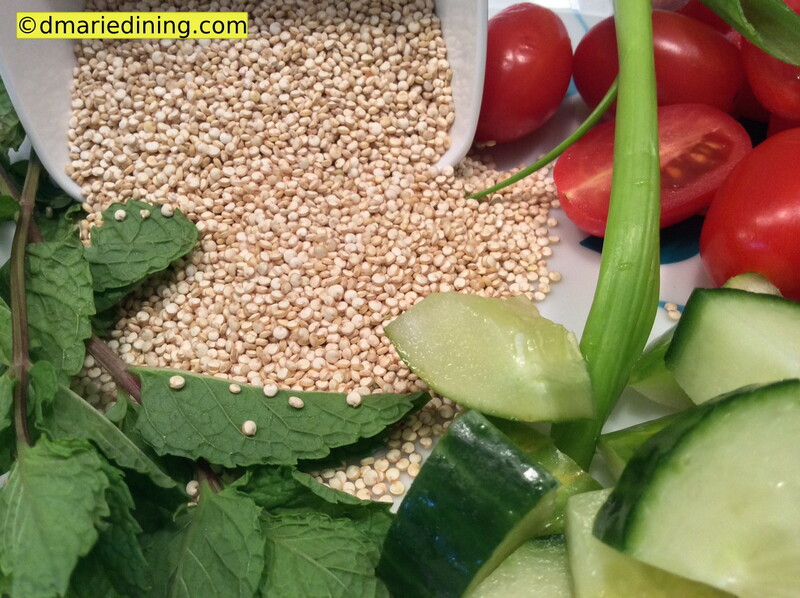 The chef on this particular show made a tabbouleh salad that looked delicious but required a little more work than I like to do. 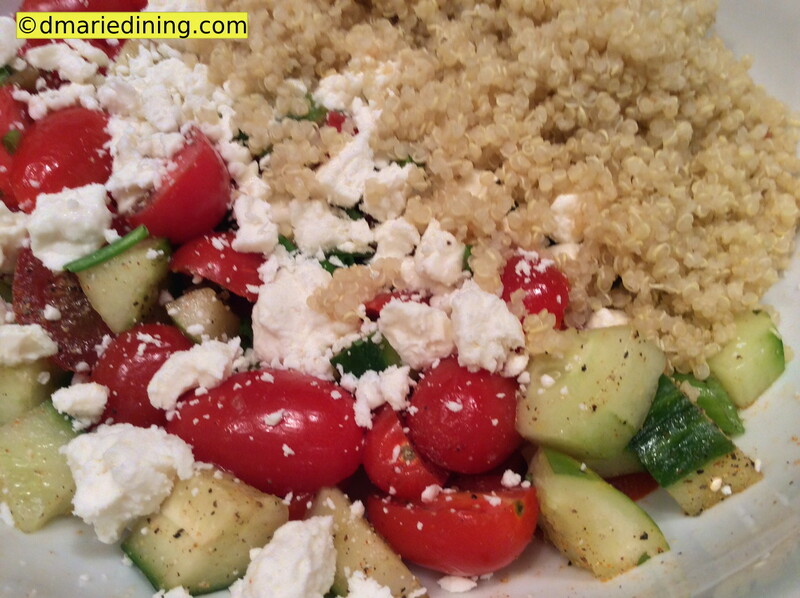 Instead of using bulgur wheat as the grain in the salad I decided to add a new twist and use Quinoa. Quinoa has a nutty flavor and takes only a few minutes to prepare. 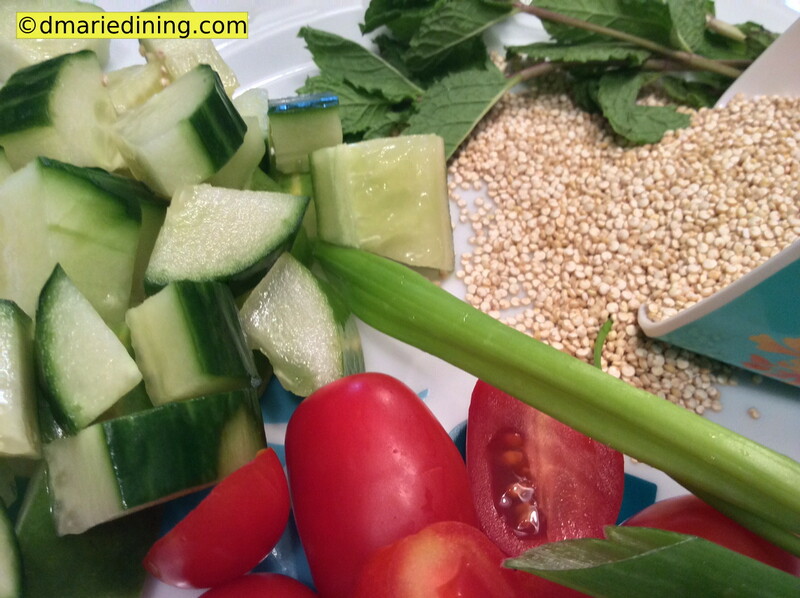 It also helped to add an extra layer of crunch to the salad along with the cucumbers. 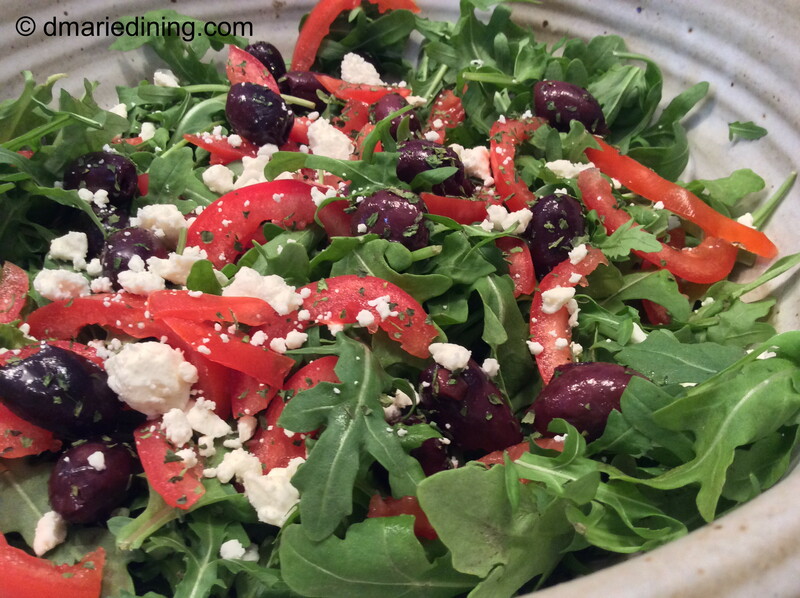 Texture and taste are two key elements of any dish especially for salads when you are trying to have layers of flavor. One of the best ingredients used in Mediterranean cooking is mint. I had not cooked with mint in the past except for making iced tea. The thought of using mint in a salad was a different but welcomed experience. It was amazing how the mint and other seasonings blended so well together and lifted my taste buds to a new level. 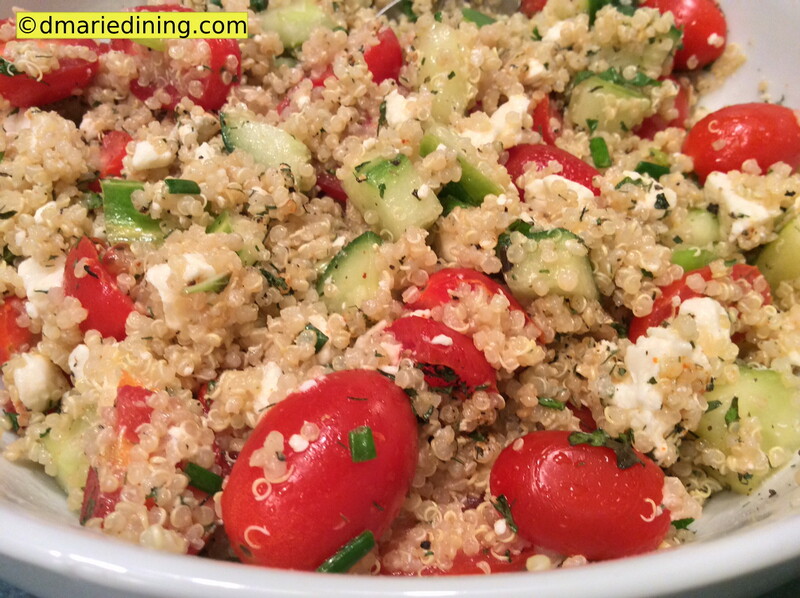 Mediterranean Quinoa salad is a wonderful side dish that goes well with chicken, fish or pork. So the next time you want something healthy, quick and easy to make try this salad to help spice up your meal. Prepare Quinoa according to package instructions. Let cool. Combine all ingredients in a large bowl. Serve at room temperature. Pasta is a mainstay in our household. Both my hubby and T are big fans of pasta. I like pasta because there are so many varieties and it is so easy to create different dishes every night if you really love pasta. Bow tie, angel hair, rotellini or shells. The list goes on and on. I have found that whenever I am really desperate to come up with an idea for dinner I reach for a pasta recipe. As soon as I say we are having pasta both my hubby and son are on board and dig in not matter how I fix it. 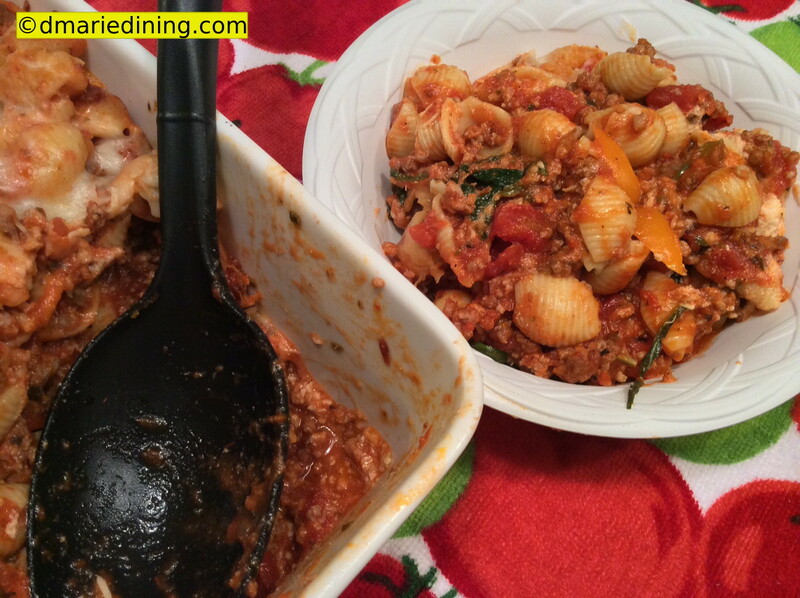 A basic meat sauce with ground turkey is the quickest way for me to get dinner on the table. However, if I can really take my time to prepare the dish, I will shoot for something with a little more heft and better presentation. No offense to spaghetti and sauce but a nice layered pasta dish is a little more exciting. Think of this as another way to make lasagna without having to cook lasagna noodles, simmer sauce for hours and then take a long time to assemble the dish. 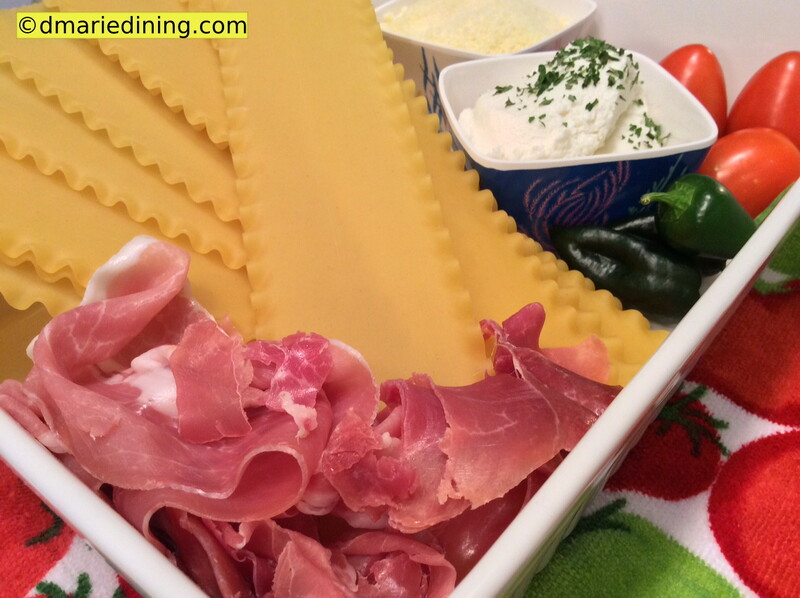 Layered lamb pasta has only two layers of pasta with lamb sauce, a few veggies and cheese. What could be simpler besides going out to dinner? For my meatless friends, you can easily turn this into a vegetarian dish by leaving out the lamb. 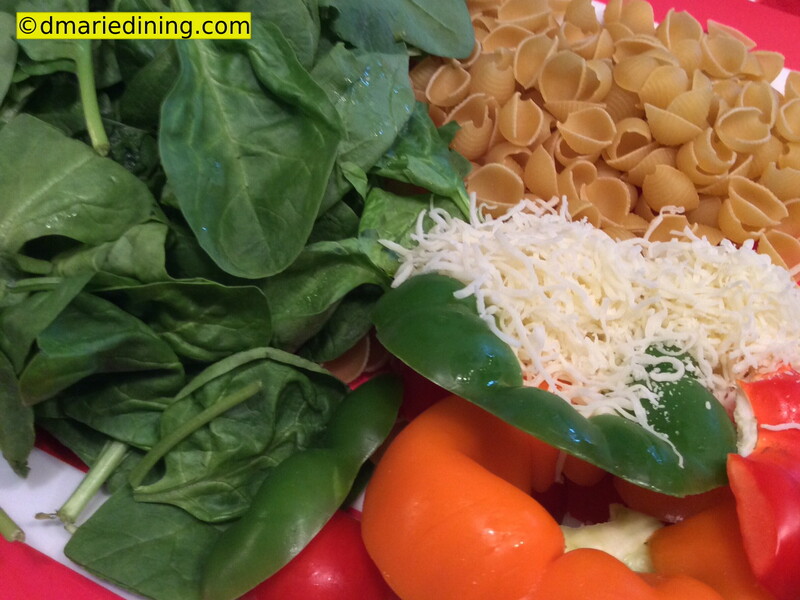 Just load up on more sauteed spinach or other veggies to layer in the pasta. Prepare pasta according to package and set aside. In a large frying pan brown lamb. Drain fat from lamb and place lamb in a large bowl. Add pasta, sauce and seasonings. Stir to mix and coat pasta. 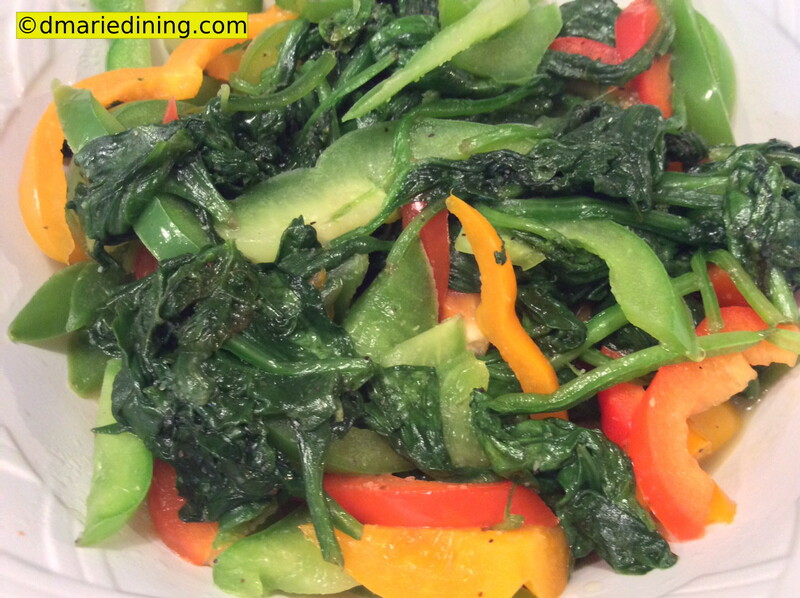 Add butter and water to frying pan along with spinach and peppers. Sprinkle with salt and pepper. 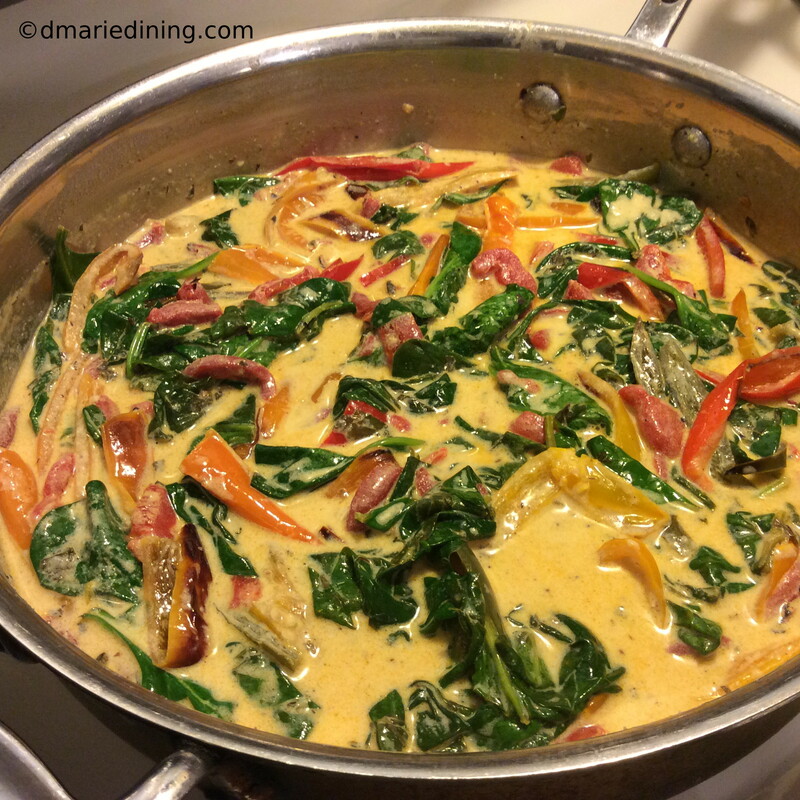 Stir occasionally until the spinach is wilted and the peppers are soft. Spray large casserole dish with cooking spray. Spread ½ of the pasta and lamb mixture in the casserole dish. 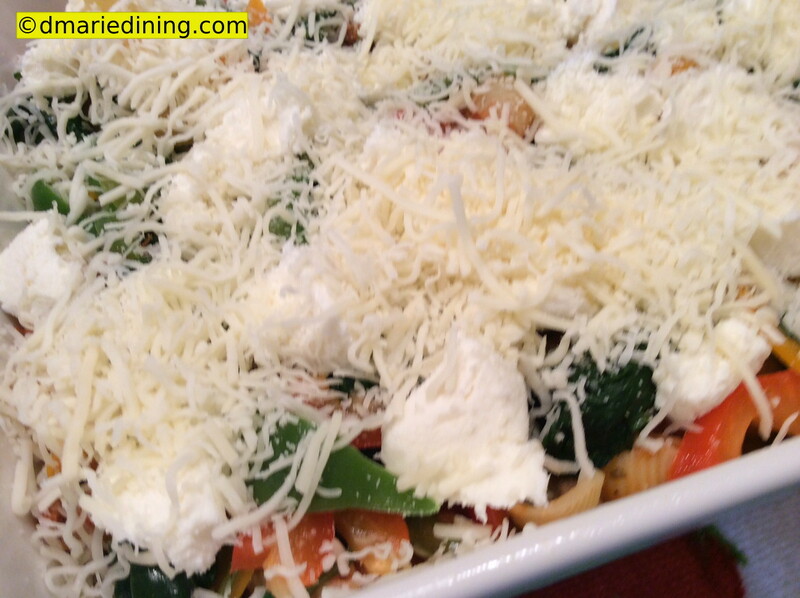 Layer the vegetables over the pasta and dot with the ricotta cheese. Sprinkle with ½ of the mozzarella and Parmesan cheese. Layer with the remaining pasta and top with remaining cheese. Bake for approximately 25 to 30 minutes until cheese is melted and pasta is heated through. Sunday dinners are the one time most families have a chance to sit down together and enjoy each others company. Growing up, my family was no different. Every Sunday my aunt and uncle, Doll and Johnnie, would come over to our house for dinner. My mom and aunt would take turns making the Sunday meal and since both are great at cooking I looked forward to those dinners. During the summer there was one particular meal my mom and aunt Doll liked to make that was easy and refreshing. Chicken and broccoli casserole topped with bread crumbs and paired with a green jello mold with fruit cocktail. I never knew how they came up with the combination of a casserole and green jello but for some reason it worked. I think it was the whipped cream and fruit cocktail in the jello that won me over. What kid doesn’t like fruit cocktail and whipped cream? Plus, the jello was cool and refreshing in contrast to the hot bubbly chicken and broccoli. 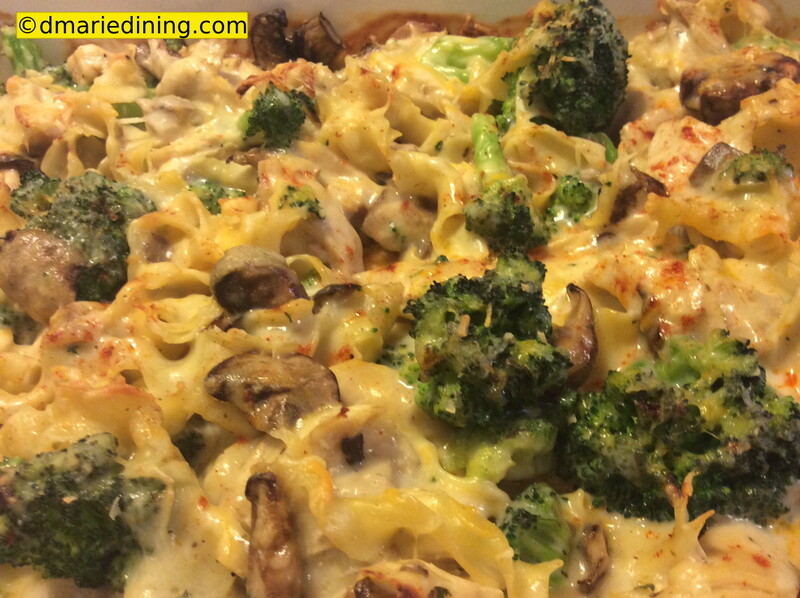 My version of their chicken and broccoli casserole has a little less fat but still has lots of flavor. There are simple substitutions you can make to cut down on the calories. 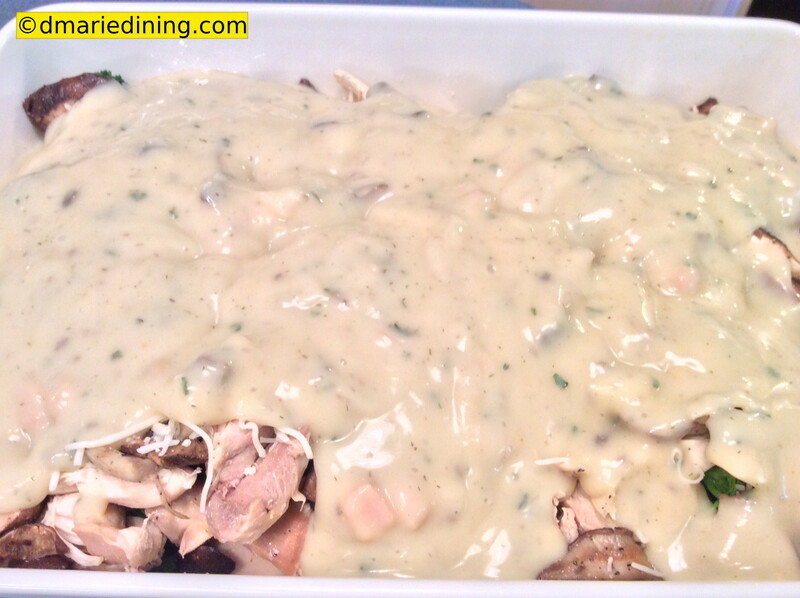 Instead of using mayonnaise in the sauce I use cream of mushroom soup along with cream of chicken soup. Don’t let the word “creamed” scare you. 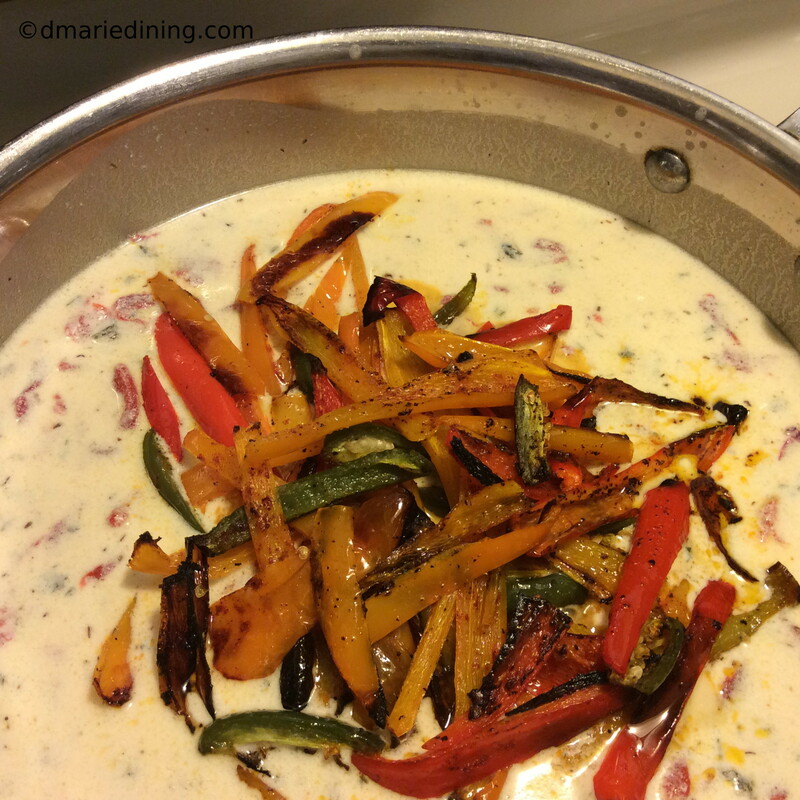 You can always find a reduced fat or fat free version of the creamed soups. Also, leave off the bread crumbs (they were browned in lots of melted butter) and use a light shredded cheese as the topping. To add more flavor to the dish I stir in sauteed mixed mushrooms (button, shiitake and portobello). This may not be my mamma’s chicken and broccoli but it is a wonderful way to make your next Sunday dinner memorable. Add a pinch of salt to 4 quarts of water and bring it to a boil. Add bag of broccoli to boiling water for 3 minutes. Remove with a slotted spoon and place in bowl of cold water to stop the cooking process. 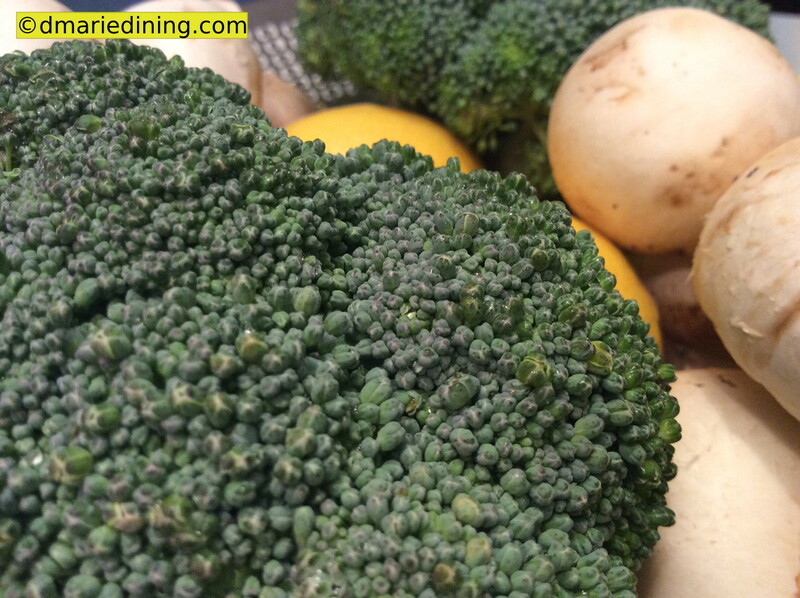 Drain broccoli after it cools and set aside. Bring water to a boil again. Add egg noodles and cook according to package. Drain and set aside. Rinse chicken and place in 6 cups of water with salt, pepper, celery and onions. Cook until done. Let chicken cool then cut into bite size pieces. Saute mushrooms in 1 tbsp of melted butter until browned. Season with salt and pepper. In a medium bowl whip together soups, parsley and milk until smooth. Add additional milk if sauce is too thick. Soups should be slightly loose for pouring. Spray a rectangular casserole dish with cooking spray. Place egg noodles in dish and then layer with broccoli chicken, mushrooms and ½ of the monterey jack cheese and ½ of the cheddar cheese. The remaining cheese will be used for the topping. Pour soup over the layers and gently mix. Top with remaining cheese and bake for 30 minutes until cheese has melted and top is slightly browned.